Last Update January 9, 2019 A digital multimeter, or DMM for short is one tool that you absolutely do not want to cut corners on. These devices can be a lifesaver in some instances, and you’ll want to make sure that you purchase the absolute best. Whether you're an electrician or an electronics hobbyist, I'm sure I have testers in our guide that will suit your needs. If you’re wondering how to determine exactly what you need to look for and are looking for some fantastic suggestions on finding the best multimeter for you, read on. Hi, I'm Simon. I've worked as an industrial electrician for the past 11 years. I've worked in several parts of the world including the United States, Australia and South Africa. Having worked in a variety of countries has allowed me to learn several different codes and regulations. 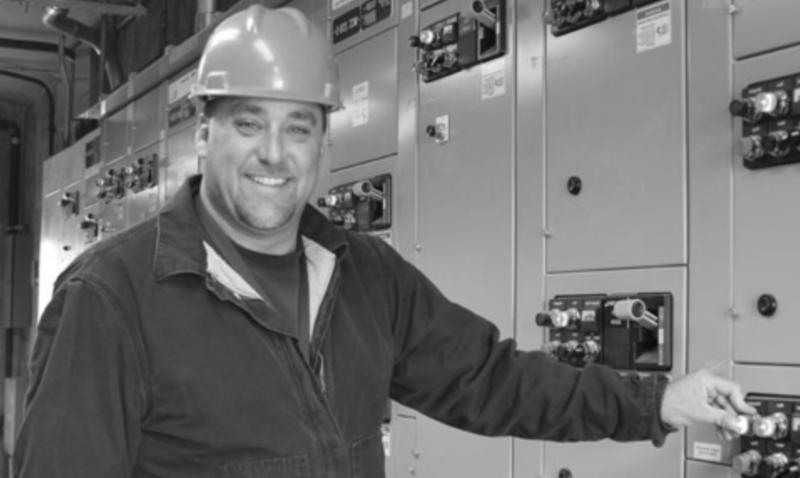 I have been in every aspect of the electrical world from installations, maintenance, fault-finding and decommissioning. I have worked with anything from as small as 5 volts right up to 11,000 volts. My main passion is working with PLCs and automation. Nothing gets me more excited than setting up a whole installation and then seeing it come to life and run on its own! I created this site as a way to quickly and easily find a quality multimeter. I understand that when you're on the hunt for a new one things can get a little overwhelming - most of them don't seem to be different from each other, yet they have huge differences in price. This is a common issue and as you are about to see, the main things that seperate them are the safety rating (how many volts it can handle), quality, accuracy and warranty. Below I have listed what I (and many in the industry) consider to be the best of the best. See the best deals on my number 1 multimeter here. What is an Autoranging Digital Multimeter? What is a Ghost Voltage? What Makes a Great Multimeter? Analog Vs. Digital - Which Is Better? Below are the top multimeters on the market, based on reviews, features, budget and quality. The Fluke 87V is a great choice, although it’s not necessarily a cheap multimeter, when compared to most models of meter. Fluke makes some of the best multimeters on the market, and they’re all designed for heavy use in the field. The 87V model has a hug AC DC Volts ranging and can even take the more obscure measurements like capacitance. In addition, this model is shielded properly so that you can get accurate adjustments despite the chaotic electrical fields surrounding adjustable speed devices. The continuity tester in this meter is loud and fast, which is great for troubleshooting in a noisy industrial environment. This model comes standard with the ability to make ambient temperature measurement, and you’ll be glad to find it also comes with a temperature probe to take surface measurements as well. 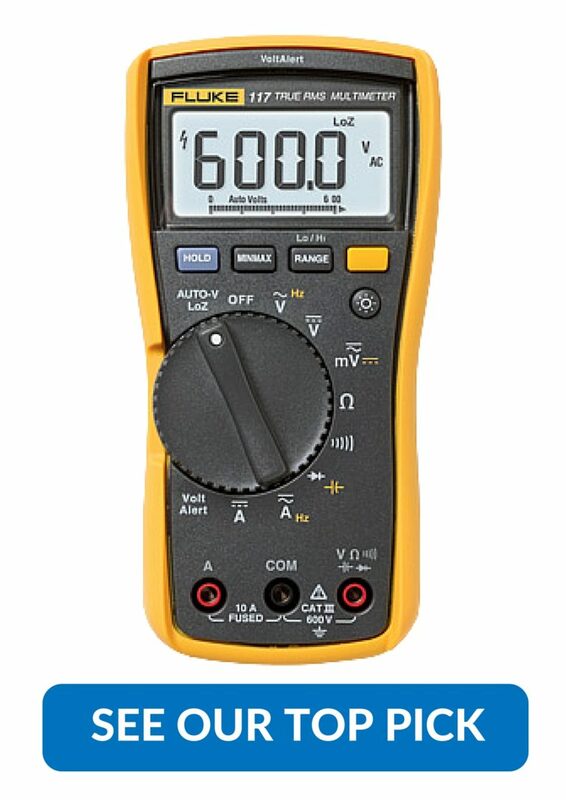 Any Fluke model of multimeter is a great purchase, and this one is ideal for field use. You’ll quickly find that it becomes a vital part of your tool kit. It really is almost a gold standard for a meter that’ll be in heavy use. See here for the full Fluke 87v review. This great little meter comes in at a lower cost than the Fluke 87V but still delivers quite a bit of functionality in a well-engineered Fluke tool. It may not be as accurate or as beefy as some of the others, but for commercial use it should be more than sufficient and it is without a doubt the best multimeter for electronics. This meter is tough and durable, made for use in the field and it covers the basics quite well. It’s impressively accurate and can take up to 600V, so while it’s not the most ideal for industrial uses, for residential and light commercial devices it’ll hold up well and allow you to get your measurements quickly and accurately. It’s a bit smaller than its more expensive cousin as well, meaning you’ll be able to more easily manoeuvre it if you find yourself in small spaces quite often. It still measures capacitance and the like, so you’re sure to be pleased with the functionality of the meter as you use it in your daily work or hobby activities. It does only come with a three year warranty unfortunately, but its smaller size and lower cost means that if the unit meets your voltage range needs you should be more than happy with it for a long time to come. See here for the full Fluke 117 review. This is a great, cheap multimeter to use in the field. The Amprobe Am-570 comes with a pretty good accuracy and is a bit no frills. It’ll dutifully read almost all of the same things as a more expensive meter, including ohms, amperage, and capacitance albeit with a slightly reduced level of accuracy. That isn’t to say that it’s a bad choice, just that for those whose lives might depend on their meter, it would be highly recommended to make a bit heftier investment to ensure your safety. For ultra-precision uses it also doesn’t come highly recommended, but the accuracy range is within pretty good parameters for most uses you might have for it. For the home repair handyman or amateur working with electronic devices this will make a great entry-piece into the world of multimeters however, and despite it’s lack of the features of some of the higher end models on this list you’ll be pleased with the great price and a useful, functioning tool to help you diagnose and repair around the house. See here for the full Amprobe AM-570 review. This is a unique multimeter from Fluke that will allow you to take readings from an app on your phone. This is a great feature for your safety, you’ll be able to de-energize a panel, connect your leads, then turn it back on, allowing you to take your measurements from a safe distance. You can wirelessly take all the same measurements you can with the meter, easily being able to troubleshoot tricky problems while you’re in the field. You use up to three of these at the same time with the same instance from the application, allowing you to save time as you check multiple connections at once while you troubleshoot whatever you may be working on. This modular multimeter does have a bit of a low tolerance for high amperage however, which is the only real flaw in its design. If you’re considering a fluke and frequently work in areas where your personal safety may be of concern, you’ll definitely want to consider adding this device to your arsenal. You may even want a few in order to take advantage of the software’s full capabilities. The unique capabilities of this meter make for a great product, and one you’re sure to be happy with. See here for the full Fluke 3000 review. This is a pretty feature filled multimeter from Amprobe. Featuring a clamp to measure amperage and some level of functionality with measuring temperature, you’ll find quite a few features in this relatively cheap package. You’ll love being able to test amperage right out of the box, these clamps require no physical contact with the line and instead give you the measurement via the magnetic properties of the current. One downside of this multimeter was that we noticed the backlight wasn't quite as bright as other DMMs. This makes for a great level of utilitarian use in the field as you can measure the amp-draw of a line easily and be absolutely sure that you’re on the correct line. It also features the ability to easily measure the temperature, making for a great cheap meter for most HVAC applications. It certainly isn’t the most accurate or sturdiest meter on the market, but if you’re on a tight budget and need a tool for residential or commercial applications this one may be the best to immediately service your needs. You’ll find the additional tools that come without having to spend any money on accessories is a great deal. This meter’s additional features and low costs certainly make it a tempting buy. See here for the full Amprobe AMP-310 review. A true RMS (root mean square) multimeter is a multimeter that calculates waveforms that are not sinusoidal (waveforms that aren't shaped like sine-waves) - or distorted waveforms so that you can get a more accurate reading of the voltage that you're measuring. These types of distorted waveforms can be present in many types of electronics and if you do not use a true RMS multimeter, your measurements can be out by as much as 40%. If you can be sure that your waveforms are pure sine-waves, then an averaging multimeter will be fine to use instead. An autoranging digital multimeter is a multimeter that automatically finds the correct range that your multimeter should be in for the reading. For example, if you wish to measure current, you simply select the 'current' setting and the multimeter will find the right range - you don't need to select 'low current' or 'high current'. A ghost voltage, also called a phantom reading is when a circuit or device is not connected to any power source, yet the multimeter still detects a voltage. To overcome these ghost voltages, Fluke recommends choosing a digital multimeter that has low input impedance. A multimeter is a device used to measure various functions of electricity, whether you need to measure raw voltage, resistance, or even things like capacitance you’ll need one to get the job done. In the field you’ll often use them to test if a wire or circuit is live as well as being able to test the individual components of a machine in order to diagnose and correctly fix it. ​In many fields of technical work you’ll find a multimeter is absolutely essential, whether you’re working as an HVAC technician or an electrical installer, these multi-purpose tools are invaluable. Many of them will also have specialty probes and add-ons which can be purchased, to further make sure that you have the right device for whatever your specific purpose is. They’ll vary in the amount of features they have and your preference will dictate which device you decide to purchase for your uses, so let’s take a look at some of the major deciding factors on which meter you’ll be adding to your tool box. When you’re in the market for a multimeter, there’s a wide range of attributes you’ll need to keep track of in order to ensure you only buy the very best. We’ll give you a quick break-down of the most important features in order to ensure that you make a great, and informed purchase for your first buy. CAT I: Only for use on circuits not connected to a main power supply. Think 24V circuits or maybe a bench power supply. CAT II: Suitable for electronics plugged directly into the power mains, provided that the circuit remains under 100A and has some sort of protection to keep it under 22,000V. This category is suitable for most 110V to 240V systems. CAT III: Suitable for pretty much all applications before the main breaker. In this category we’ll have the correct protection for devices which may be plugged in continuously to the main like the three-phase motors attached to a refrigeration system. CAT IV: Suitable for working with the direct power source into a building from the transformer. CAT rated meters are designed to prevent electrical arcing and keep you safe. You’ll still need to make sure that the voltage range of your chosen meter is appropriate for what you’re working with in order to get an accurate reading for diagnosis and testing purposes. The best multimeters will also have a fuse to cut-out if the amperage reaches an unsafe level, this will protect both you and your meter. Some meters may cut out after being exposed to higher amperage for an extended period, and you’ll be glad for this lifesaving feature. Apart from the safety aspects of your meter, most are rated for a specific range of voltage and current. You’ll want to match this to your needs, especially if you’re shopping for a bargain. If you’re working with small energy circuits at home, your needs will be quite different from someone working with a house’s main or a big industrial circuit. Most high-end meters will be able to cover a wide variety of uses, from measuring mV to working with a power main - which can be up to 400 volts in some homes and businesses. You should also take note of the fact that the range of measuring capability may vary between AC and DC power sources, meaning that there are two different specifications you’ll want to check on. If you’re working with particularly precise measurements it’s important to make sure that your purchase has the highest accuracy available. The accuracy ranges can get incredibly precise, so you’ll be sure to find one to fit your needs even if you’re working with the most delicate of circuits. The size and ruggedness of your tool is a prime consideration, especially for those who work in the field. Anyone who hasn’t had a tool drop from a bag on a ladder or some other mishap involving misplacing or mishandling something is either magnificently careful or just hasn’t been in the field long enough for it to happen to them. You’ll want a rugged meter with a lot of protection for most applications away from a work bench because sooner or later your multimeter is sure to take a fall or otherwise be abused a little bit. Another important consideration that often goes hand-in-hand with the durability of a meter is the size. If you find you’re often working in tight spaces, you’ll likely want to go with a smaller meter to make sure that it can fit easily into where you’re working. If you have too massive of a meter to fit into the space you’re going, you’ll find you may as well not have one at all. See the best deals on our number 1 multimeter here. Multimeters can typically be utilized for a variety of functions, with some of the more advanced ones even being able to read capacitance and temperature in addition to the usual features. You can add even more to either practical functionality or expanding your meter’s uses with the correct multimeter accessories. The most commonly used of these add-ons will probably be your leads. You’ll want to find the right test leads for your purposes. The most common of these are simple tapered pieces of metal that will require you to make contact manually with both at the same time in order to get your reading. There are also alligator clips style leads, so that you can leave one or both hands free while you take your measurements. Among the other major accessories you’ll find temperature probes. These are especially useful in the HVAC field, as you can take temperature measurements without having to carry an additional device. These temperature reading DMMs have an inbuilt thermocouple, so you won't need to purchase any extra gear - just use the probes that it comes with. Another majorly useful add-on that’s relatively easy to find are amperage clamps. These handy devices will read the amperage in a line for you easily without the need for physical contact, simply open the ending claw and pass it over and allow it to shut. One thing to keep in mind always though is to make sure that any additional supplies you purchase for your uses are compatible with your current meter. Most manufacturers will have this information readily available so you don’t have to waste your time and money. Although not really considered an accessory, always have spare batteries on hand - you don't want to be stuck with a dead meter whilst in the middle of an important job. It’s important to make sure that your investment is properly guarded against accidental failures. Make sure that whatever you purchase you find a multimeter with a great warranty, the peace of mind you’ll gain from doing so is worth it. There is sometime a range of options available from the manufacturer, and most multimeters will be covered for at least a year from time of purchase. You obviously can’t just abuse your meter, but you’ll be able to rest easy knowing that if it suffers from a manufacturing defect you’ll be able to get the issue resolved speedily. The last thing you’ll need to take into account is the overall purchase price. There is a precise balancing factor here, as long as the safety features are in place and you have your desired functions you may wish to go with something a bit cheaper. You’ll want to be careful about going to cheap with your meter however, especially if you’re dealing with dangerous currents as a shoddily made multimeter may malfunction in the field which can be disastrous for the operator. The first multi-meters were all analog, meaning that they have a mechanical gauge to measure with. Analog multimeters are still around, but to a greatly lesser extent than in the past. There are some serious drawbacks to using an analog meter, they’re harder to read and the new digital models far surpass them in precision because of this. They remain a cheaper option however, and if your work doesn’t require an extraordinary degree of precision you may want to look into them. Analog meters can also be prone to parallax errors caused by looking from the wrong angle at the gauge. You’ll need to make sure you’re looking dead-on at the meter in order to ensure the greatest amount of accuracy possible. The one area where analog multimeters hold the edge is when you have a voltage fluctuation, as the gauge will change in real time and a digital might simply display erratic numbers. The needle can move smoothly to show the changes as the energy being read fluctuates. But possibly the greatest drawback of analog multimeters is one of simple functionality, they will only be able to read voltage and ohms in almost all cases.Digital meters are usually a lot more expensive, but strictly as a matter of utility you’ll find them far superior for most purposes. Many of them can read down to hundredths or even thousandths of a unit, and because their easy to read displays will make the facts of your reading plainly visible to you. When you’re picking out a multimeter, be sure to keep in mind all the information we’ve covered here. Really the matter of picking one depends most on what you’re going to be doing with it, and some are undoubtedly more suitable than others for different applications - some people won't need diode testing or frequency readings at all, while others will require the most accurate AC Voltage or Impedance readings. Remember that cost should be the last consideration for these devices if you’re using one in the field. You want only the absolute best multimeter you can find for work applications and when you’re working with higher currents and amperage. The Fluke series cannot be recommended enough for heavy field use, they’re simply some of the greatest multimeters. Not everyone requires a meter for field use however, and some may be just working around the house or play with electronics as a hobby. In that case, you may want to save your wallet a little bit and take a look into the highly functional Amprobe brand meters detailed above. They’ll serve you well and last for a long time for small electronic and residential applications. Majority of DMMs will come with a 9v battery right out the box, so you'll be up and troubleshooting as soon as you've read the ​instruction manual! Once you have a great, functional instrument in your hands and you learn how to use it, you’ll be amazed at the utilitarian use of it and with a proper first choice for your individual application you’re sure to be pleased with these highly functional instruments for a long time to come.